The 2018 Financial Modeling Competition was a private equity case study where participants play the role of an Associate at a private equity firm. All contestants received a case which contained a Confidential Information Memorandum (CIM) about a private business that is for sale and being marketed by an investment bank. With participants from all around the world, this was one of the most intensive finance competitions, where financial modeling skills are put to the test with a real-world case study. Participants were required to build a financial model in Excel, value the business, and make a recommendation about whether the private equity firm should invest in the business or not, and if so, how they should structure the deal. Focused on real-life scenarios, this online competition will challenge participants to showcase and celebrate their financial modeling and valuation skills, knowledge and excellence in the industry. Participants will take part in a single round of elimination designed to test their technical knowledge of financial modeling. The 2018 case is based on a Confidential Information Memorandum (CIM) for the sale of a private business presented to a private equity firm. As an analyst at the firm, your task is to take all of the financial information provided in the CIM and build a financial model to value the business. Once your valuation is complete you will determine what you think the business is worth and make recommendations to the Investment Committee at the PE firm about whether or not they should invest, at what price, and how the deal should be structured. You are an Analyst at the private equity firm Silver Lane Management, which invests in high growth companies with an expected internal rate of return of 25% or more. This CIM was prepared by an investment bank, Mid-Market Advisors, to help their client SHOX raise a round of growth equity. Should the firm invest or not? What is the maximum price the firm can pay and still earn their targeted IRR? As soon as the financial modeling competition commences you will be notified by email and can download all case materials from your user account on financialmodeling.org. You will have access to documents that contain instructions, financial information about a company, industry information, and case situation for a private equity firm. Once you have the case package and have carefully read through it, start building your financial model in Excel. You’ll have to use assumptions and data from the case to build your forecast, link the three financial statements, and perform a discounted cash flow analysis. With the model complete you can now start to make your recommendations about the investment opportunity and build a short PowerPoint slide presentation. You’ll have to include what you think the company is worth, how a deal could be structured, and highlight the risks and benefits of the opportunity. Use a free screen recorder (such as screen-o-matic) to record a 5 minute delivery of your presentation and recommendations to the partners in the private equity firm. Be sure to introduce yourself or your team, the findings and insights from your model, and your official recommendation. Upload all requirements for the CFI Financial Modeling Competition before the 1 week time period is over. SHOX: We are looking for $40 million in growth equity, by issuing new common shares. We will use the net proceeds from this offering to expand our production of suspensions for powered vehicles, and for general corporate purposes. 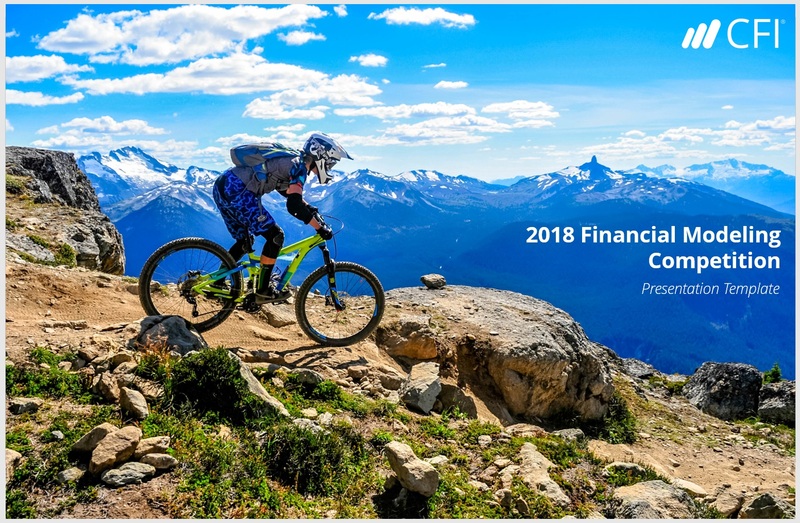 Increased sales opportunities for high-end mountain bikes in international markets. The “Financial Modeling Competition – World Case Championships” is a life-changing experience that fosters education and commitment to continuous education. Participants will have the chance to showcase their expertise and gain international credibility through an accumulation of practice, hard work, work experience, and continuous education. Register today to embark on an exciting adventure! Embrace the opportunity to demonstrate your subject mastery, accumulation of hard work, and expertise across a broad range of topics by entering our annual finance competitions!